Just a couple of years ago we had devices with a max storage space of around 64GB to 128GB at best. Flashforward to 2019 and we’re probably going to see a bunch of smartphones being launched with a whopping 1TB of internal storage. 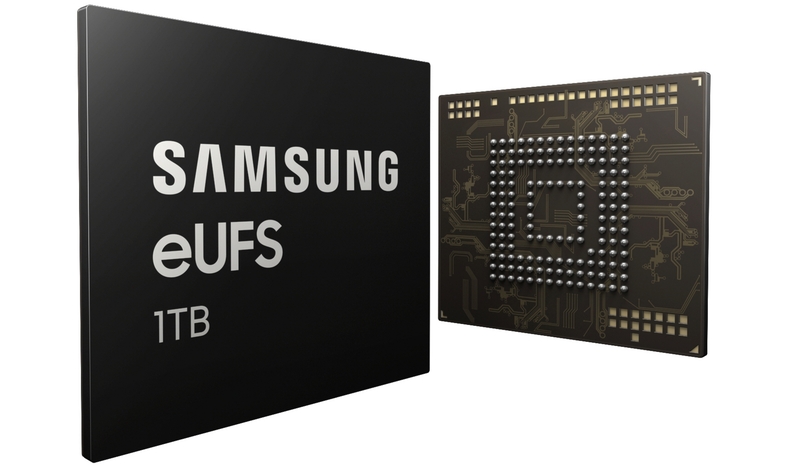 Samsung has announced its 1TB eUFS 2.1 chip for smartphones and has already begun mass production. The new 1TB chip is the first of its kind and would be available for smartphone OEMs to use with their upcoming devices. The new memory chip is extremely quick since it offers transfer speeds of up to 1000MB per second and read speeds which are claimed to be 38% faster than what we get with the 512GB flash storage chip. Now those are some insane speeds, to be honest, and it clearly indicates that these new 1TB memory chips would cost a pretty penny. The new chip is the same size as the 512GB variant and also has write speeds which are almost 500 times quicker than a typical micro-SD card. These numbers might not be all that cool for those who aren’t familiar with the topic so to sum things up; the 1TB flash memory chip is blazing fast. “The 1TB eUFS is expected to play a critical role in bringing more notebook-like user experience to the next generation of mobile devices,” claims Cheol Choi, Samsung memory marketing VP. Given the exciting announcement, most of us are speculating whether or not the Galaxy S10 lineup would come with the 1TB storage variant option. As of now, it seems likely that we would see at least one variant in the Galaxy S10 lineup with the 1TB storage option. However, this doesn’t take away the possibility completely hence we might see a Galaxy S10 variant launched a couple of months later with the 1TB storage option. Nonetheless, this is quite an interesting development since we could possibly see more devices come with the 1TB chip in the near future.